1. 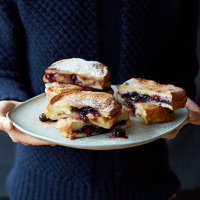 Arrange the slices of banana on 4 of the brioche slices and scatter the blueberries on top. Drizzle with honey and then place a slice of brioche on top. 2. Place the eggs in a dish with the milk and cinnamon or vanilla and lightly whisk – the dish should be big enough to hold all the sandwiches, so a roasting tin would be ideal. Place the sandwiches in the egg mix and soak for 5 minutes. Turn over and repeat for the other side. Keep turning till each sandwich is soaked well and all the egg mix has been absorbed. 3. Heat the butter in a large frying pan and gently cook the sandwiches for 3–4 minutes each side until golden brown. You’ll probably have to do this 2 at a time. Transfer the fruity eggy bread to serving plates and serve while still warm, dusted with icing sugar. Frozen sliced bananas are very useful for baking and smoothies – freeze on trays until firm before transferring to freezer bags.